Many people in the Vila Nova de Poiares neighbourhood learned to swim in the swimming pools at Recreio da Fraga leisure complex (nicknamed Fraggle Rock in our house) but it became neglected and was closed down for many years. Thanks to the efforts of the local council and local investment, the space was fully renovated in 2013. Since then, this impressive complex of river-fed swimming pools and surrounding leisure areas has been a favourite spot to cool off in the summer months. Better still, it’s free to enter although you’ll have to pay a small fee if you want to use the umbrellas or sunbeds. Sadly, the October 2017 fires didn’t spare the Piscinas da Fraga and much of the infrastructure was badly damaged. Thankfully, the local council and other organisations have pulled together to repair the damage in time for the 2018 summer season. One thing that I felt the pool area was still in need of is a pool cover. Funnily enough, I was viewing some really practical Perth pool covers when I was travelling around recently. It might be a good idea to invest in one similar for this pool. Note: To celebrate, there will be a reopening party on 1st June if you’re in the area. Otherwise, keep an eye out on the relevant Facebook page for news about live bands and other events. This is the deepest pool with sun loungers to the left, a football pitch in the background and hopefully a restaurant on the right. The onsite café offers reasonably priced food or drink but you can take a picnic if you want. 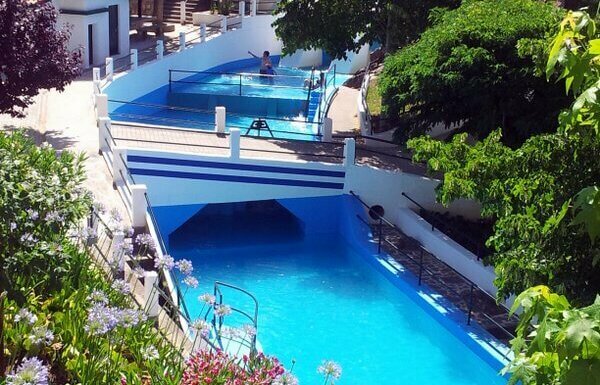 There are several swimming pools of differing depth and size so if you get bored or find one pool too crowded, go and check out one of the others. Not surprisingly, the complex is extremely popular in summer and it’s not the place to come for serious swimming although it’s quieter in the mornings. If you’re looking for a place to swim as exercise, try a different river beach. If you simply want a fun place to hang out with local people and cool off on hot summer days, this is it. It’s a lot busier than this in the afternoons! 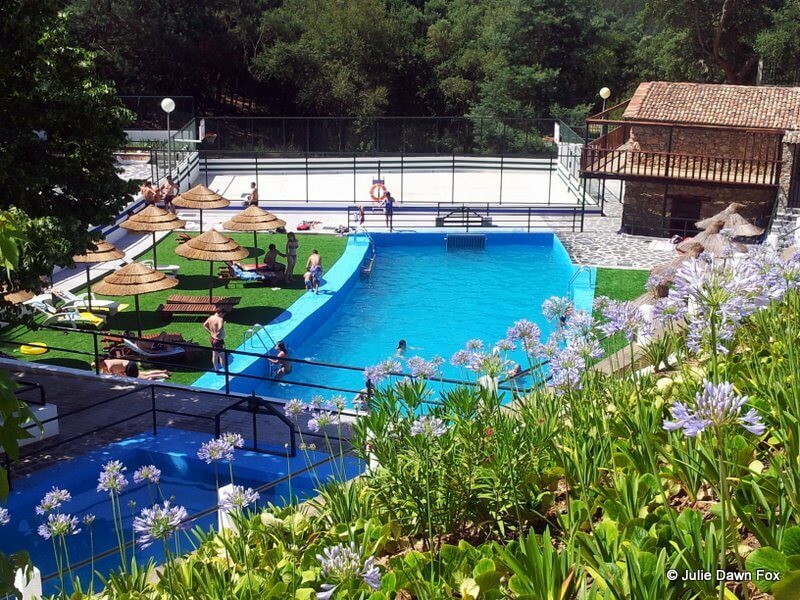 Recreio da Fraga leisure complex is open from 10 am to 8 pm every day, at least throughout the summer (June 1st to September 15th). When there’s live music, it’s open until midnight. Follow the brown signs leading you off the EN 17 from São Miguel de Poiares. There’s plenty of free parking above the complex if you can’t find a space near the entrance. Hi Tanja, I doubt you’ll find anything outdoors, even in the Algarve that’s open at that time of year. It’s winter here and many hotels don’t even fill their pools until Easter at the earliest. Try asking the water parks in the Algarve but I wouldn’t hold your breath. Drat. The site tells me that it’s bandwith has been exceeded !! Looks to be a lovely place. How ‘warm’ is the water ? 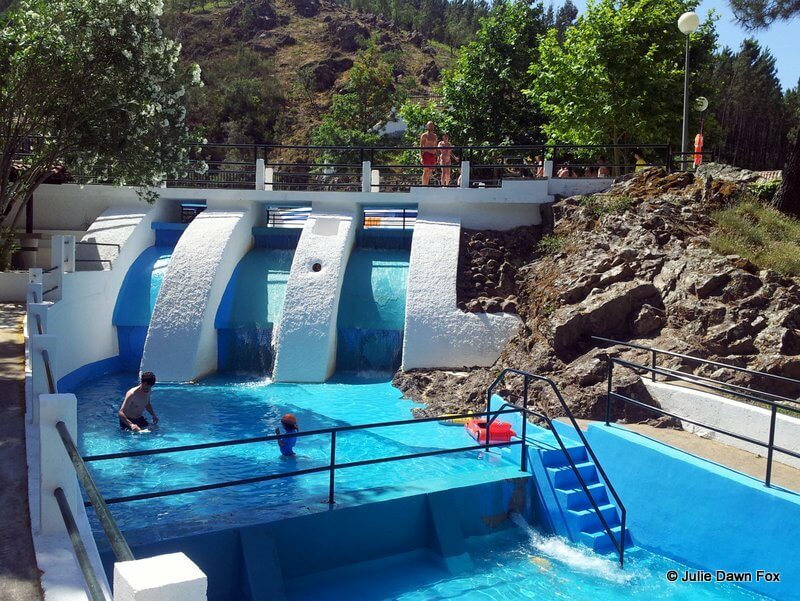 I have found even in this heat in the aqua parques the water is often freezing !! BTW … would it be possible for you to put a little map on these wonderful posts of yours so we can tell where they are ?? The kids got straight into the water with no fuss but I’m more of a baby when it comes to cold water so had to ease myself in gently. It’s not too bad though and once you’re in, it’s warm enough to stay there for as long as you want. I’ll look into the maps. Thanks for the suggestion. OK .. one day I will try to get down there! It looks such fun. And I am a baby with cold water too – I rather prefer it to be like tepid soup !!! lol!! Thanks for looking into the map thing .. that would be so helpful !! Thank you! I’m glad you enjoy reading them, even if they do make you homesick. Looks very inviting, Julie. There’s a nice one at Sao Bras de Alportel, not too far from Tavira too. Reminds me- must get back to my A-Z’s! I’ve been sidetracked lately. All well with you? I know all too well how easy it is to get sidetracked, Jo. I haven’t forgotten my A to Z though and have a couple of posts lurking in the wings. Hope all’s well with you, too.